Select Vacation Villas has the best selection of properties in the Windsor Hills Resort – and this condo is a perfect example of this! Welcome to 'Dory's Retreat' This fantastic 3 bed/2 bath 1247 sq ft condo is situated on the 4th floor, which is a prime location just next to Windsor Hills Resort’s 5 star clubhouse and amenities. On your vacation, you’ll be sure to find the inside of this condo is just as much of a treat as the outside view. The main living space offers not only plush relaxation with sofa, but also hours of entertainment with a large screen plasma TV with cable, DVD player for those cozy nights in. 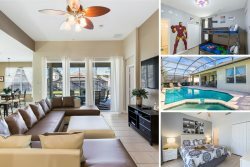 Leading off the living room, you will find a dining area with seating for 6 as well as a fully equipped spacious kitchen with stainless steel appliances will meet all your cooking needs while on your fabulous Florida holiday. At night, get ready to drift away into sweet dreams. Master bedroom number one has a King sized bed, upgraded ceiling fan, flat screen cable TV and an en-suite bathroom. The second bedroom has a queen sized mattress, while the 3rd bedroom offers a fun Dory's, from Finding Nemo theme with an two twin beds and also a LED TV with cable. Enjoy your own screened-in balcony perfect for the evening relaxation after a long day at the parks. This condo is the perfect choice for a magic family vacation, ensuring a relaxing and memorable vacation! The condo is located on the 4th floor with both elevator and stair access.